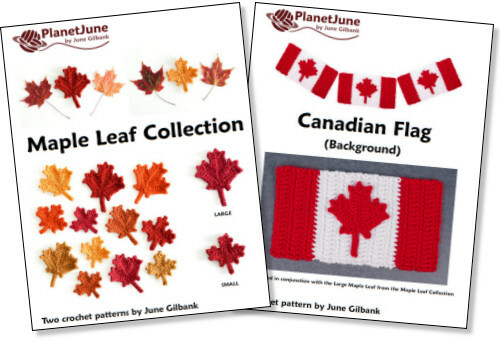 Maple Leaf Collection includes two different sizes of maple leaf to crochet (and a bonus Canadian flag pattern). Each leaf is worked in one piece, with a clever construction that gives a realistic shape and the suggestion of veins. 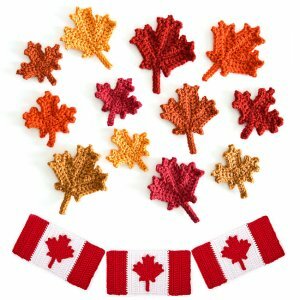 Use a single crocheted maple leaf as an appliqué on a hat or sweater, glue it onto a greetings card, add a pin back and make a maple leaf brooch. Crochet lots of leaves in a variety of colours and scatter them on your mantelpiece or Thanskgiving table, or group them together into a beautiful fall garland or wreath. Maple Leaf Collection is an original crochet pattern by June Gilbank, including patterns for two different sizes of realistic leaves. When worked with the suggested yarn and hook, they are approximately 2.75" and 3.5" wide, but you can easily vary the size of your maple leaves by using a finer yarn with a smaller hook to make a smaller leaf, or heavier yarn with a larger hook to make a larger leaf. For each leaf size, you'll find both the written instructions and a complete stitch diagram on a single easy-to-print page. For more detailed assistance, the pattern also includes general instructions with photos to help you understand the construction of the leaves, and separate appendices for right- and left-handers including row-by-row photos and stitch diagrams for each leaf, and step-by-step photos for the special combination stitches used. You can also make the large Maple Leaf into a perfectly proportioned Canadian Flag! The flag background pattern is included as a free bonus PDF with this pattern purchase. Yarn: worsted weight yarn in any leaf colour (e.g. red, orange, yellow, green, brown), or any other colour of your choice! Small leaf: approx 2.75" (7cm) wide by 2.25" (6cm) tall, excluding stem. Large leaf: approx. 3.5" (9cm) wide by 2.75" (7cm) tall, excluding stem. Date Added: 09/30/2018 by Aleksandra S.